We’re here to provide answers and help your business grow. We believe that behind every successful local business is a banking partner dedicated to helping a dream become a reality. Meet our team of expert business bankers, led by Kimberly Moyers. With our proven strategies and team approach, we’re positioned to help you find answers and reach your business goals. Your success is our collective goal. As a team, we channel our individual strengths and experiences to provide tremendous value to people, businesses and this community. Our team is made up of experts with a strong knowledge of our community, vision, and a proven track record for leading growth initiatives. At our helm is Kimberly Moyers, Market President for North Central West Virginia. Kimberly's commitment to banking and our communities are represented through her service with the American Bankers Association, Monongalia County Development Authority, Morgantown Area Chamber of Commerce and the United Way of Monongalia & Preston Counties. Our goal is to develop strong and lasting relationships with families and businesses within the communities we serve. From customized product solutions to financial education and volunteerism, we are determined to be your helpful, trusted partner for life. What makes our relationship so special is that we are vested in your success, which makes us all the more passionate about serving you. We’re focused on innovation and draw from the best that technology has to offer to provide highly sophisticated and extremely personalized solutions. We keep our eye on the future to anticipate your evolving needs, while honoring the values upon which this bank was founded more than a century ago. Welcome to the ultimate banking experience, one that continually transforms to support your vision, make you stronger and help you grow. 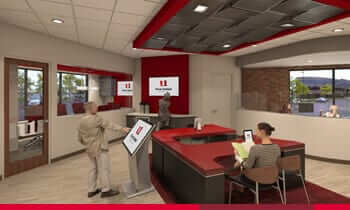 Learn about our renovation efforts and take a virtual tour here.